Work 7 days a year for free? Would you do that? Square.ca is advertising on TV telling babysitters, for example, that they can now accept credit card payment and it will ONLY cost them 2.75% of the amount charged. Do these low-wage earners understand that accepting credit card payment will mean that they will be working 1 week and 2 days without pay every year? Yet, that is what 2.75% of the charge means. I find that objectionable. If these workers were working for an employer, how would they feel if they were told that they would have to work 7 days a year without pay? My travelling partner, Gabrielle, has been counting the days and there are few left before she is wearing her fur-lined boots back home in Regina, so she is soaking up the sun at the beach of Alicante. I take off to wander around and see some of the lovely old buildings. 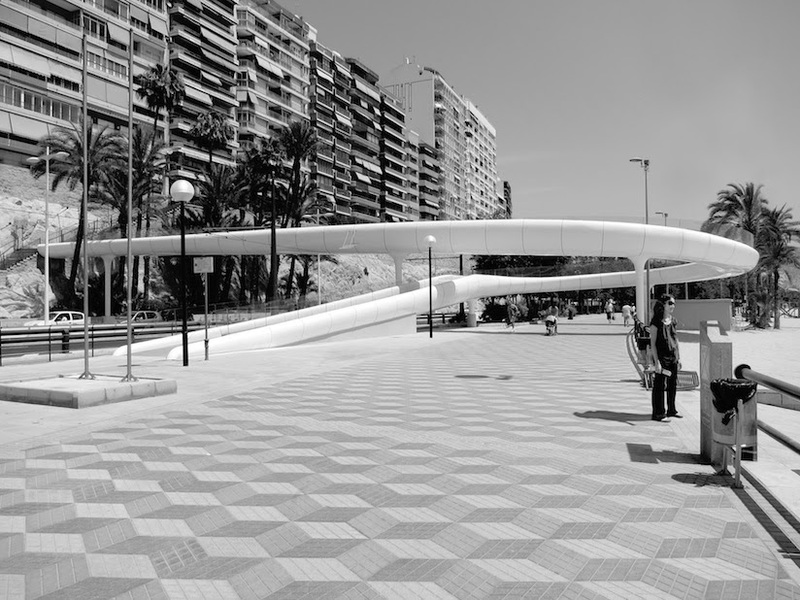 Thinking it would be too much like the Puerto Vallarta of Southern Spain, I had hesitated about coming to Alicante, but the town itself is a gem. I want to go up to the Castillo de Santa Barbara on Mount Benacantil and to see the 360 degree view over the town, but I can't find the elevator which takes tourists up. I am standing alone trying to decipher the indication on my little map. Alicante is a difficult place to figure out at times because it is built on a hill and of course, the maps don't show what layer you should be at. 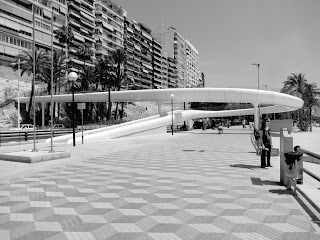 To get to the elevator from the beach, there is a busy road that you can only cross via a superb looping pedestrian bridge, the Pasarela del Postiguet, two or three hundred meters long, that goes from the beach to the other side of the road; you go around slowly climbing inside the loop and up about 30 steps and you're above and across the busy street below. It doesn't take long before I'm accosted by a kindly looking local gentleman offering to show me the entrance to the elevator. I tell him there is no need to walk along with me; "If you just point me in the right direction, it should be easy to find." It turns out that one has to go through a tunnel, about 300 meters long before reaching the elevator. "I am just doing my daily walk," says Luis, "solo paseando". And he will be happy to come along; it will be no trouble at all, he assures me. It very slowly sinks in that Luis was 'solo paseando', looking for someone to warm his bed. Up around the castillo, he points to his house over in the distance, behind the architecture museum; he does not seem to notice that each time he comes closer to me, I step away another meter; he now points to his ex-wife's house. "We are still friends, you understand." "Better be friends in two separate houses than enemies in the same house." I tell him, and he agrees. The visit lasts a good 20 minutes. The castillo is an interesting historical spot and the view is, as promised in the guide book, spectacular. My companion is, as we would say in French, no higher than 3 apples, but he is a handsome sort of fellow in a rustic kind of way; lots of hair and blue eyes. And he does not walk like an old man. I can tell he has charmed a few women in his days (perhaps the reason he has been sent to pasture by his previous wife - or perhaps he was telling me fibs all along - perhaps his wife is busy cooking supper for him...) His hand reaches 'casually, as if absentmindedly' over to my forearm a bit too often. I need to ditch him because he doesn't seem to get the hint that all I wanted was to visit the castle. Back at street level, I reiterate that there is no need to accompany me back to my hotel (When he asked where I was staying, I told him I could not remember the name of the hotel, just how to get there. Over there, I had said, pointing somewhere in the distance.) "No se preocupe," says Luis, (don't worry), "I need the exercise; it is my daily routine." It is an unfortunate hazard for women who travel alone, no matter their age, that men of all ages will assume they are looking for action. I have experienced it many times before. Oscar the Cuban artist; George the Mexican poet; Mohammed the Turkish doorman; Archhhhhmed the Parisian student from Egypt...all young, all handsome, all penniless and willing to do anything to upgrade their financial status. But Luis is no student, no artist, no poet; he is... let's be frank, a horny old man. He is handsome enough that a few Lolitas would likely succumb to his charms given a small stack of euros, but thinking perhaps that I am some damzelle in distress, he is hoping he might be able to leave his wallet in his pocket. Along the waterfront, I stop and point to one of the less ostentatious moored yatchs. "Three times the size of ours," I say. "If only my dear husband could be here with me to enjoy this, he would love sailing around here. but unfortunately when business calls..."
A few steps later, Luis suddenly remembers that he is expecting visitors at home and he must catch the next bus. I stretch my hand to shake his. "No beso?" he begs. "No beso." I smile, "gracias y adios." Bradley Manning - spy or hero? "He was a soldier. And as a soldier, we are expected to be disciplined and we are expected to comply with our orders and our directions." Hitler's soldiers did just that. Mussolini's soldiers did just that. Franco's soldiers did just that; Saddam Hussein's soldiers did just that. American soldiers did just that in Viet Nam, Iraq, Alghanistan... and continue to do so wherever they are, generating hate for the US (and the West in general) all over the world. Bravo for Manning for telling it like it is. The cold-blooded killing of innocent people is murder, no matter who does it. The ones who fired are the ones who should go behind bars. It is heartening to see that soldiers and subordinates are finally rising against their superiors and following their conscience. No more of this blind obeying of orders that perpetuate hate and lead to humanitarian disasters. Soldiers should not be trained as robots; they have a brain and a conscience and they should be allowed to use it when their superiors are giving the wrong orders. In my books, Bradley Manning is a hero. I arrived at my hotel very late but nevertheless enquired if there was a tour to Mysore the next day. In India, with the remote possibility of backshish, everything is possible. A quick telephone call and I was booked for a 7 o’clock pick up the next morning. For the equivalent of $10. I would be picked up at my hotel to join a bus of Indian tourists for the 140 km drive south to Mysore, a tour of the city and return to my hotel. Promptly, on Sunday morning, a taxi arrived at my modest hotel where I seemed to be the only tourist and the only woman; I was delivered to the tour bus. There was one seat left at the front, by itself: the only seat with actual view to the road from where I would enjoy the semi-tropical flowers and the palm trees during the two-hour drive to Mysore. In India as in Mexico amongst others, for some reason unknown to me (but I suspect it is to prevent road fright) a curtain is drawn at the front of the bus, behind the driver. On this particular bus, the curtain was actually only ¾ of the way so that I luckily had unobstructed view. I was the only non-national on the tour and was thus offered that seat, the very best one on the whole bus. It was a little humbling but, knowing the hospitality of Indians, I knew every single one of them was proud to let me have that seat. Shortly, a young woman behind me asked: “Excuse me, Madam, what is your country?” I was, by then, very used to this question and was thankful for all the times it had been used as an overture to conversation. The young woman was part of a group of 6 young people, all university graduates spending 2 months in Bangaluru training in I.T. They were from all parts of India. I ended up spending the day with these very lovely newly graduated students; it was not the first time that I experienced the wonderful hospitality of Indians. When I tried to purchase their lunch in order to show my appreciation, they flatly refused. "No, no, Auntie, you are a guest in our country." At dinner time, I managed to sneak payment for their meals to the waiter but when they realized what I had done, they firmly refused to let me pay and asked the waiter to refund my money - they paid for my meal as well as their own. Back in Bangaluru around 11 pm, the bus driver announced that unfortunately, it was too late for him to drop everyone off at their original departure point as he was supposed to do. The 6 students refused to leave until a solution had been found to have me safely delivered to my hotel. Not being familiar at all with Bangaluru, I had not wanted to take a taxi, and eventually, the kind bus driver talked to his supervisor who instructed him to drop me off at my hotel. I was sad to part from my young friends but the memories will remain. My hosts Norma and Oswaldo could not have been more pleasant. As is often my luck when I travel solo, I received royal treatment on a small budget during my stay in this Unesco site nicknamed "The Pearl of the South". I could not have found a more inviting place to stay and more attentive hosts. My room was impeccable and with a definite Cuban feel, and the newly renovated bathroom had lots of convenient hooks and shelves; hot water was available at all times. My room had air conditioning although I did not use it. In the alcove of my room, a small refrigerator was at my disposition and a stock of water, beer and soft drinks for me to purchase if I wished. Oswaldo and Norma's was the kind of house where I did not even lock my bedroom door so confident did I feel of my hosts' integrity. and about $6. for a wonderful dinner of fish etc. I enjoyed Cienfuegos so much that I ended up staying three days, although I had planned only on two. and the pedestrian mall are perfect for strolling; this nostalgic Colonial city is well worth a visit. And if you don't feel like walking, a bicitaxista will take you around at your leisure for about $2. an hour. 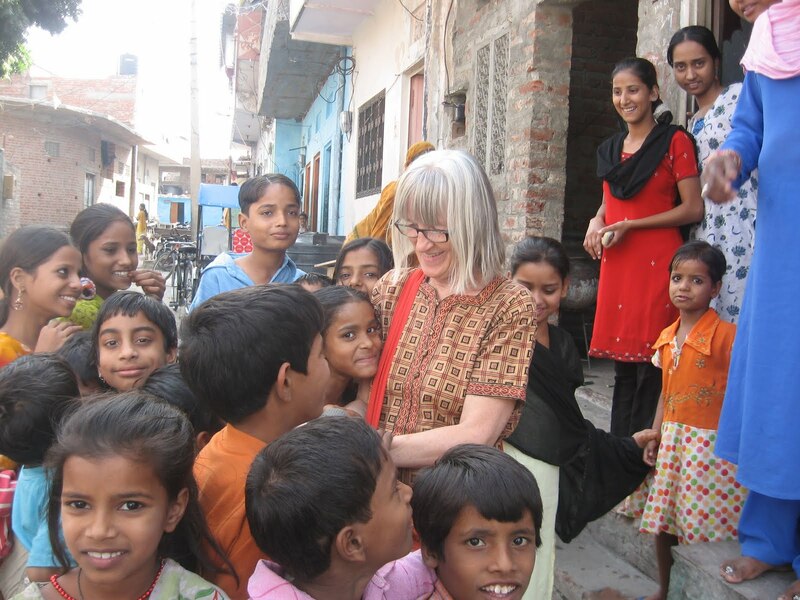 A visit to someone's home in India has always been a wonderful experience for me. That day, I visited Papu's home. Papu is my rickshaw wallah in Jaipur. The family of five lives in one room; The kids sleep on roll-up mats and the couple share a single bed. There is one trunk that holds all their clothing. There is a washroom in the building for all the apartments (about 12) When I visited, Papu's wife offered chai, as all good Indian families would do, and they sent the chidren to buy some cookies for my chai. The whole neighbourhood came by to meet this strange white-haired lady; I was a real event in their neighbourhood. 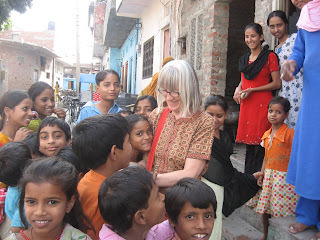 I had only a few words of Hindi then and so it made for a rather fun visit. The warmth of these people is absolutely legendary. I never feel lonely even when I am travelling alone in India.